The new year promises to be full of potential for San Diego International Airport (SAN) and its owner/operator, the San Diego County Regional Airport Authority. And that means good things for the entire region. This year, together with Mayor Kevin Faulconer and regional agencies led by SANDAG, we will address the long-standing issue of forging a better public transit connection to the airport. We believe it is time to collectively envision how people will get to and from the airport into the future, and make our transportation system the best that it can be. At the same time, we will advance the Airport Development Plan, centered around replacing the aging Terminal 1. Everyone agrees this is long overdue! Count on us to pursue more international nonstop service to Central America, South America, Asia and Europe, while adding new domestic routes, as well. We are committed to expanding our connectivity to the world. You can also anticipate more opportunities for small and local companies to do business with the airport, something we are proud of, and committed to providing. Meeting growing demand and providing outstanding customer service. We are committed to creating the world-class airport San Diego has come to expect and celebrate. We promise the best is yet to come! Since my last message of October 24, there has been a series of very productive meetings with local agencies and Mayor Kevin L. Faulconer regarding the Draft EIR for the Airport Development Plan (ADP), and I wanted to provide you a progress report. On November 20, Mayor Faulconer convened the leadership of the Airport Authority, SANDAG, the Port of San Diego and MTS with City staff. Specific suggestions to deal with both near-term and long-term solutions for traffic impacts and transit access were brought up and will be considered by the individual agencies. The Mayor asked the participants to report progress in approximately 30 days. Time is of the essence, as delay will add an estimated $8 million per month to the total ADP cost. There is also universal desire to see Terminal 1 replaced sooner rather than later. While it is likely that the Airport Authority will recirculate the DEIR, that will depend on decisions made about the path forward. Our goal, shared by many, has been to address comments on the Draft EIR for the ADP, including the replacement of 50-year-old Terminal 1, while allowing us to move forward expeditiously. Related traffic impacts and transit access will require the collaboration of SANDAG, MTS and other entities. Solving one of San Diego's perennial issues – transit connectivity to the airport – is now a group effort, as it should be. On our part, we have developed an updated air travel forecast scenario based on 2018, which will be submitted to the FAA for approval this month. We have also committed to revisiting the parking requirement contemplated in the Draft EIR. And we have initiated conversations with the FAA about potential financial participation in off-airport roadway and transit improvements. One point to emphasize is that the San Diego County Regional Airport Authority is regional far beyond its name. We serve air travelers from throughout the region. The airport's nearly $12 billion annual economic impact is truly regional. And our nine-member Board includes representatives from north, south and east, as well as central San Diego County. It is exciting to report true progress. I look forward to updating you periodically as we advance our efforts to deliver a better airport for the region. You may have read media coverage about the Airport Authority's Airport Development Plan, which centers on the critically needed replacement of Terminal 1. The news coverage hasn't told the whole story, so I am writing to you today to provide a bit more insight and clarity directly from the Airport Authority. Admittedly, we may not have shared details of our program and the planning in a way that best addresses some of the stated community concerns, so my goal with this letter is to start a more positive and constructive conversation with everyone. One key area to address upfront is the issue of off-airport spending. We've said repeatedly that the Airport Authority is willing and able to pay its proportionate share for road and transit improvements around the airport, but the message seems to have been lost along the way. Let me state unequivocally that the Airport Authority is ready and willing to pay our proportionate share for road and transit improvements that make it easier to get to the airport. While it's true that the Authority must coordinate funding with the FAA, which regulates our spending, we are not forbidden from off-airport spending on infrastructure projects. In fact, we've done it before, working with our Federal partners to fund improvements to Sassafras Street, Washington Street, and Harbor Drive. We have already launched discussions with the FAA to determine the extent to which we can help pay for additional projects that are off airport property. As many of you understand and agree, the plan to replace Terminal 1 and make related improvements is necessary to accommodate ever-growing numbers of air travelers and ensure the airport can continue to function efficiently as a gateway to the rest of the nation and the world. The airport already employs approximately 9,000 people and contributes nearly $12 billion annually to the region's economy, a number that will only rise with the successful completion of the Airport Development Plan. Most would also agree that we need to provide air travelers with better ways to access the airport via both our streets and transit – a key part of the Draft Environmental Impact Report for the new Terminal 1 project. The mobility ideas cited in our environmental impact report are not any one agency's sole responsibility. Recognizing this, the Airport Authority launched the Harbor Drive Mobility Committee in January 2017 to pull together our key partners to determine what improvements are needed and how we can work together to accomplish them. The committee includes planners and policy makers from the City of San Diego, SANDAG, MTS and the Port and others who would need to work together on mobility solutions around the airport. We've also worked directly with SANDAG and MTS on near-term transit improvements to enhance the Trolley-to-Terminals connection to the Middletown station. We all agree that more needs to be done here, and we're committed to working with SANDAG and MTS to make this connection function at its highest level. Follow-up meetings to discuss next steps are already scheduled. It's become apparent recently that long-held plans for mobility around the airport may need to be revisited. For over a decade, regional plans have called for an Intermodal Transit Center, or ITC, that would serve as a connection point for the trolley, Amtrak, the Coaster and, eventually, the planned high-speed rail. We've committed to providing an on-airport connector to this ITC. 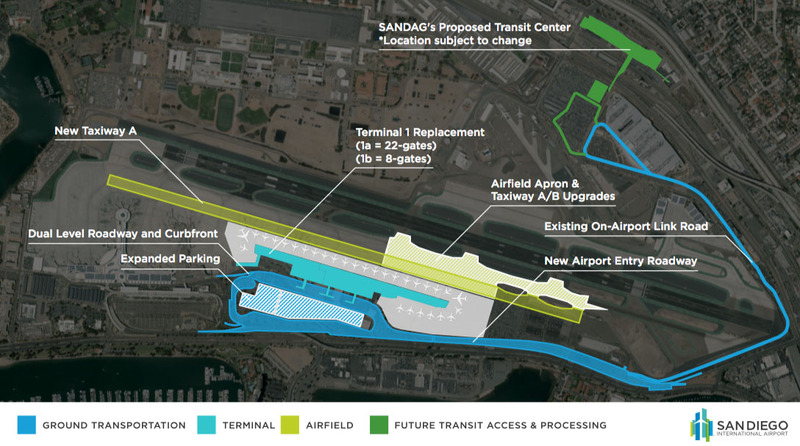 While many are now questioning the region's established plan, the ITC remains the solution identified in SANDAG's Regional Transportation Plan, and it was therefore included in the Airport's EIR. If our regional planners determine the ITC is no longer the desired solution, and a change in direction is formalized, the airport can adjust plans for connectivity. We stand ready to participate in that conversation. Further, our environmental impact report discusses other mitigation measures, including a connection to the Old Town station and enhancements to MTS bus service to the airport – options we are discussing with MTS and are ready to help pay for, pending MTS concurrence and FAA approval. These items and others were discussed at the Harbor Drive Mobility Committee meeting Wednesday (October 24). Additionally, the Airport Authority has pledged $166 million to build a new entry roadway on airport property that will connect Laurel Street and Harbor Drive directly to the airport, removing an estimated 45,000 cars per day from Harbor Drive. Inbound airport traffic will be separated from local traffic on Harbor Drive. This roadway improvement also provides a dedicated connector to the north side of the airport to allow the connection to the ITC to operate independently from all other traffic, something Circulate San Diego has been advocating for and that is already in the plan. Ultimately, the dedicated connection could become an automated people mover to the ITC, once that facility is built. Another benefit of the on-airport roadway is that Harbor Drive will have to accommodate fewer cars, creating an opportunity for the City or SANDAG to use the extra lanes for a future dedicated bus lane or trolley line along Harbor Drive that would not be possible under existing conditions. The airport's plan sets aside space for an on-airport roadway system for outbound traffic as well. To make that happen, the airport is seeking input from the Harbor Drive Mobility Committee on how to connect the eastbound lanes to existing lanes on Harbor Drive and Laurel Street to formalize the changes. Assistance from our partners is critical to developing the appropriate solution. The airport, along with the airlines, is extremely eager to provide a better experience for our mutual customers. These customers are business travelers, convention attendees, vacationers, our service members and our own families and friends who use the airport every day. We have heard from the community and we are taking your comments seriously. There is recognition that the Terminal 1 replacement project is too important, timely and necessary for our region to be delayed, but we have to do our part to address community concerns. We hear you and we're ready to pay our share of needed improvements. We look forward to working with regional agencies and members of the community at large to create the airport we all need and deserve. The Airport Development Plan (ADP) is the next master-planning phase for San Diego International Airport. In 2006, a county-wide ballot measure to move the airport was defeated. Therefore, the airport will continue in its current location for the foreseeable future. The ADP identifies improvements that will enable the airport to meet demand through 2035. An additional runway is not being considered. The ADP considers replacement of Terminal 1 and the creation of new non-airline revenue opportunities. The new Terminal 1 will be designed to accommodate current/modern standards for passenger terminals, flow and security. The Airport Authority has prepared a Draft EIR for the Airport Development Plan. A copy of the document is available for review here on the San Diego International Airport website (see Draft EIR link below). The public comment/review period ends and comments are due by September 7, 2018. Comments may be emailed to planning@san.org (see Notice of Availability link below). What is the Airport Development Plan?Why is the ADP needed?Who is spearheading the ADP?What are the primary components of the ADP?What sustainable design features are included in the ADP?How much will the project cost and how will it be funded?What is the project’s status?What is the environmental review process?What is the timeline for the project?How can I provide input on the ADP? The Airport Authority is committed to keeping the public informed throughout the Airport Development Plan four-year process. There will be multiple opportunities for public input during the planning process and the formal environmental review. If you are interested in inviting an Airport Authority representative to make a presentation about the Airport Development Plan to a group that you’re involved with, please contact Jonathan Heller at (619) 400-2891 or jheller@san.org. See behind the scenes of San Diego International Airport! The Airport Authority offers free tours of the airport and airfield, including up-close looks at the runway and public art. Tours are two hours long and are offered four times a month – each second and fourth Thursday at 10 a.m. and Friday at 1 p.m. For those interested in taking a tour, please click here. As part of the public outreach for the Airport Development Plan, the Airport Authority will host community meetings at various project milestones. Dates and locations will be posted here. The meeting information will also be communicated to San Diego area media outlets. If you would like to be added to the Airport Authority’s email list to be kept informed about the Airport Development Plan, please email Rebecca Bloomfield at rbloomfi@san.org.